My neighbor, Rachel, is a resident in OB/GYN who works in a busy Jerusalem delivery room. She has attended hundreds of births, but her own self-described “miracle birth” to her 7th child last week ended up catching her completely by surprise. “For the last few weeks of the pregnancy, I was checking every day to make sure the baby’s head was down. And the day before I gave birth, like every day, I checked. Head down. Everything OK.
“On the day of the birth, my labor progressed quickly. 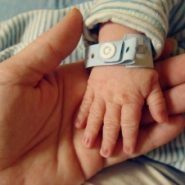 By the time my husband and I arrived at the hospital, I was 10 centimeters. “But then the doctor who examined me said, ‘I don’t feel the head…’ She tried to act calm like everything was OK, but I deliver babies. I understood that this was a bad sign. “The baby, it turned out, had managed to flip sometime during the labor. He was transverse, lying sideways. This is extremely rare, it only happens in 1 out of 400 births, and can have life-threatening complications. Women can sometimes give birth to breech babies, but no woman can deliver a transverse baby. It’s impossible. “Within seconds, I was surrounded by a team of senior OB/GYNs, anesthetists, midwives, and nurses and was rushed into the operating room for a C-section. “I asked the doctor if it would be possible to flip the baby into a head-down position. I’ve never heard of a doctor in any Jerusalem hospital flipping a transverse baby so close to the birth. But in the end, that was what he did. He gently turned the fetus between contractions and managed to get him head down without causing any rupture of membranes or other problems. “His heart rate started going very low with every contraction, so the doctor calmly instructed me to push him out very quickly. After hearing her incredible story, I was curious to know if Rachel felt her birth was different at all because of her work in obstetrics. “So I was watching the monitor, to monitor his heart rate. How often have I been there? A situation in life feels scary. Out of control, even. And like Rachel, I try to get on top of the situation. Stay in control. So I stop looking at the monitor. And hope, with G-d’s help, like Rachel, for good news…. MAZAL TOV! Couple Celebrates 21st Anniversary and Birth of 1st Child! What an amazing story! It also teaches me that I can imagine the best case scenario in scary situations because Hashem can do anything – and it will work out in a way that’s pleasant for me if that’s what’s best. Very inspiring story and distilled insight from you, Chana Jenny. Thank you. This really hit a nerve. Got to stop looking at the monitor and just trust in Hashem.